Having a Yorkie is a big responsibility, and most of us do not have the advantage of staying at home all day to spend time with our furry friends so we often leave them alone on their own during the day. This is a common practice and problem, mostly with city residents, as many do not have a garden or enclosed area that Yorkies can access during the day. For Yorkies, this can be a serious problem, since loneliness can lead to some major behavioral problems, such as separation anxiety. The Furbo dog camera is an excellent solution if you want to keep your Yorkie under control through the day or knowing what is happening at home with your Yorkie while you are at work. In addition, if you are leaving from home for a while and don’t want to put your dog through the hassle of having him stay at a friends house or in some kennel the Furbo is for you. It helps to relieve stress seeing that your dog is safe at home and having a fun time with some treats. This will assure you that you don’t have to run home to care for your Yorkie. If you have wished to help solve your dog loneliness problem, then Furbo is a great option. 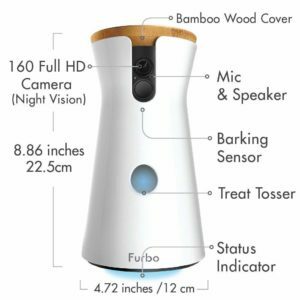 The Furbo dog camera is loaded with many features and strongly built, it was designed with the help of veterinarians, engineers, and other experts. Just download an application to your mobile phone, and connect to your home network. Once you connect, the gadget can stream 1080p video to your smartphone via Wi-Fi or 4G. Not like some smart cameras, Furbo Dog Camera does not require a continuous subscription. The application is available on iOS and Android and it provides some quick ways to relate with your Yorkie. You can take a snapshot or a video with a click, and you can as well turn on the two-way microphone to talk and listen to your dog or click to dispense a treat. 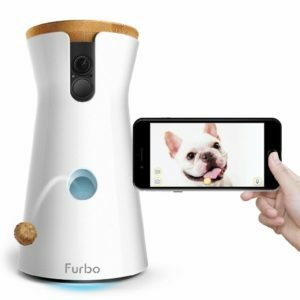 Furbo dog camera is a treat dispensing camera for Yorkie owners who experience separation anxiety when they leave their beloved Yorkie at home. At first glance, Furbo sounded so absurd to be true. The cylinder is partly dog-treat dispenser and partly camera, allowing Yorkie owners to be able to see their furry friends while they are away. You have the ability to fill the dispenser with over 100 pieces of your dogs’ favorite treats, which will allow you to play a game of catch with your Yorkie. And if they feel their pet is lonely, they can toss dog biscuits, or sing and talk with them. Fubo comes with free sample packs of treats and here are some other recommendation: Zuke’s Mini, Nutro Mini, Natural Balance Mini-Rewards, Crazy Dog Train-Me Mini. This makes it a little closer to the experience they get when you are home. Furbo allows you to talk to your dog from work. Real-time smart alerts is a key feature to the Furbo which includes dog activity alerts, dog selfie alerts, and person alerts as well. You can turn off any alert you are not interested in using. This application ensures that you can get the most out of Furbo by receiving bark alerts, dispensing treats, taking photos and videos, monitoring your dog, talking to your furry pals and more. The quality of the video is excellent and the treat dispenser works perfectly. It is also an amazing and well-designed dog gadget that should not be ignored. The peace of mind of being able to check on how your dog is doing and interact with him is also something that you will soon understand that you cannot live without. If you have a desperate barking Yorkie, with Furbo you don’t have to worry about when your dog starts barking to disturb the neighborhood. Furbo can be set to send you automatic barking alerts when your Yorkie starts barking. The equipment even filters out normal noise, which reduces the chances of getting unnecessary alerts. And you can activate and deactivate the barking alert feature, which means that messages will not disturb you at work. Certainly, you will need to share your dog tricks and fun moments with everyone! Furbo makes it possible for you to film that special moment and snap many photos from your smartphone, even when you are not at home. The Furbo will capture your dog’s day in a doggy diary in a 60 seconds highlight video. And with just a tap on the screen, you can simply send high-quality videos and images to your social network accounts like Facebook and Twitter. The camera is HD and includes night vision for those dark moments. Is that its audio capacity is fairly weak, both the microphone and the speaker can be of higher quality. 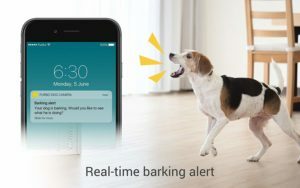 The barking alert can be very sensitive: you can disable or turn off the push notifications if it becomes too frequent. There is a preimum subscription package of $7 per month. 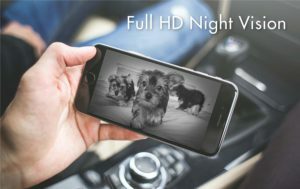 Buying Furbo Dog Camera can make life easier for you and your dogs. You will no longer worry about leaving your dog at home alone and what happens when you are not around, and your dog will no longer have to wonder why you are not home, because even when you are miles away, your dog will still feel your presence, And you will be able to see and communicate with your dog anywhere you are. If you want to do more with your dog even when you are not at home, purchase Furbo today. This gadget allows you to really interact with your dog, even when you are not at home and give you the opportunity to receive alerts if there is a problem.